A legal career can be an abyss for the shy and squeamish. The law firm setting, particularly, can be ferocious — like a tropical storm that swallows those without a purpose whole. Whether you are a recent graduate of a four-year institution or a paralegal program, or a seasoned paralegal with several years of experience under your belt, many still find themselves unfulfilled or lost at sea with no end in sight. Thus, it is extremely important to know the reasons why you are working in a law firm and how to maneuver around the turbulence in your path in order to achieve your desired goals. The stage of your professional career can often dictate where you want to go in life and what you want to become. Many recent graduates want to work in a law firm to “try on” the shoes of a lawyer to see if they fit. More seasoned paralegals may want to switch practice areas to see if they prefer one discipline over another. Career paralegals have already decided that law school is something that does not interest them but, perhaps because they have grown accustomed to making a decent salary without the same pressures that attorneys are often under, they choose to remain in the field. Wherever you are in your career, here are some valuable tips that I have acquired over nine-plus years working in various large and small law firms, to help you navigate through the perilous sea so that you can reach those golden shores. 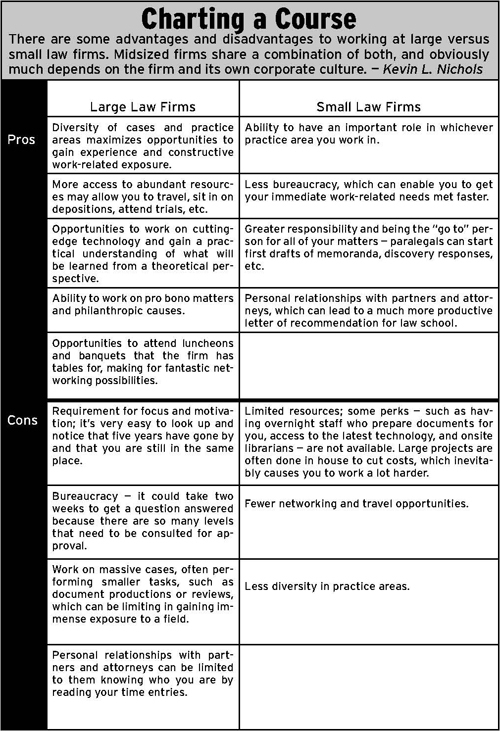 I recommend working at a large or midsized firm to cast a wide net of opportunities. It is equally as important to learn through experience what you do not like as it is to know what you do like. Large law firms (200-plus attorneys), particularly, are like vast oceans for individuals seeking direction in life. Large firms typically have diversified practice areas that can lead to other tributaries for careers. For example, at my first firm I was a litigation paralegal who sat on the corporate department’s floor, due to lack of space, with practice groups such as patent, trademark and financing. I was able to assist these groups with patent application filings, series A and B financing, bankruptcy cases, and some trademark work, just by seeking out various individuals on my floor. The key trait here is self-confidence and being outgoing. There are countless opportunities to gain invaluable experience; however, they rarely come directly to you. You have to seek out people who can open new waterways for you to travel. These may lead you away from the law and steer you toward business, software, marketing, or other viable careers depending on your exposure and your newfound interests. Once the graduation celebrations dissipate and the pressure settles in regarding future career plans, many people decide to work in a law firm to see if they want to be a lawyer. This is a wise decision if you are a motivated person. You can see the inner workings of a firm and the dynamics between professional staff and support staff. That may ultimately assist you in being a better solo practitioner, by knowing how much staff to have and how long it takes to get things done. There is, however, a hierarchal structure at large, midsized and small firms that is important to understand early on. Typically, the hierarchy begins with partners or shareholders, then moves down to other attorneys, business managers, paralegals, secretaries and case assistants or file clerks. This structure is not for everyone, especially because you will most likely be entering at the bottom of the chain. However, that kind of position will allow you to be more fluid in gaining experience outside your formal job description, in order to determine if being a lawyer is right for you. Motivated support staff can maneuver around being “specialized” to learn as a generalist until the time comes to make a decision about the future. In contributor Kevin L. Nichols’ eyes, big and small firms offer distinct advantages and disadvantages for paralegals pursuing a career or other type of goal. Click here <http://www.law.com/img/ca/legalpro918.jpg> for a chart examining these issues. It is vital to understand whether or not you want to be a lawyer early on while working at a law firm because it can help you determine the right stream to take to achieve this goal. It would be awesome to work at a top AV-rated large law firm; however, if you are not gaining measurable experience, you might be better off working at a midsized or smaller firm. I only recommend working at a large law firm to become an attorney if you can master what a career paralegal does without losing sight of what you are there to accomplish. Career paralegals may have “tried on” the lawyer shoes and have determined that they do not fit. They should know what they want to do and have a map to get them there. Ultimately, career paralegals have to decide what they really want to do in life and be honest that oftentimes it is not actually being a paralegal. I know career paralegals who have started their own consulting companies or public relations firms, who are talented musicians or who have become very active with nonprofit organizations, all while maintaining a full-time dedicated job to their employers. In order to achieve feats such as these, they require steadfast priorities and must be able to master balance. The first priority is to your employer. Give your day job 100 percent. Once you have determined what is the most gratifying part of your professional life, map out where you want to travel and what the best route to get there would be. Look within the firm to evaluate what aspect of your career you would like to further develop and see if there are opportunities to satisfy this aspiration. This could be working with the firm’s marketing, recruitment, pro bono or other departments that you would like to explore. Once you have found something that interests you, whether it’s inside the firm or something that you create outside of the firm, dedicate some time during the nights, weekends or whenever you find time outside of work to make those dreams happen. In summary, the pathways support staff take while working at law firms depend on each individual’s own determination and drive. I have been to trial three times, worked on numerous pro bono matters, and traveled doing document reviews and productions. I also own a small publishing company in San Francisco and write about topics that concern me and my community. You can choose to ride the current of the law firm that you are employed by, or you can set a course to go up your own stream to achieve your goals. Whether it is a small, midsized, or large law firm, know why you are there and what you hope to take with you during your voyage through life.